Since 2011, ImWind Technik GmbH, independent power producer, and BaxEnergy closely collaborate to boost Austria’s development of green energy, contributing to reduce CO2 carbon emissions in the Country. 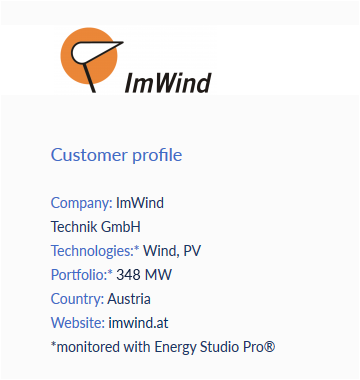 By monitoring and controlling its growing portfolio of solar and wind power plants under Energy Studio Pro, ImWind has become much more responsive in managing its renewable assets, enhancing their value and preventing potential issues. As the number of assets grows, it becomes more and more complex to coordinate all the decentralised activities performed by different teams, while avoiding to lose important information. This was the problem faced by ImWind that wished to structure and streamline its process in order to efficiently drive asset operation and maintenance. As a consequence, company’s personnel spent considerable time to manually manage huge amount of data, to inventory all the information in lots of different documents and to track the status of the obligations to fulfil or those already accomplished. Without a standardized documentation, not only we do a lot of unnecessary manual work, but also we face the risk to have incorrect and duplicate data as they can be stored in multiple places or not be kept up to date. Achieving operational efficiency was right at the forefront of ImWind’s mind: this is the key factor that led the company to adopt BaxEnergy’s comprehensive asset management solution. AssetStack provides the company the right set of tools to improve the way to manage and record the full asset lifecycle, ensuring the correctness and completeness of the operations. Thanks to AssetStack, each data is stored only once but displayed at many different places so to be accessible to various teams and people. This translates in a big advantage allowing us to easily identify synergies among the data, to plan resources and daily operations and – last but not least – to take proactive actions to minimize inventory costs. Additionally, with the advanced documentation capabilities offered by AssetStack, the fulfilment of obligations can be done on time, reducing critical barriers and optimizing procedures and the overall workload management. Since the adoption of AssetStack, ImWind is taking benefits of leaner and agile business processes, reducing redundant operations and increasing team productivity. By doing so, we have reached a higher level of transparency on asset status and activities’ progress. This also helps us to build our own knowledge base, sharing experience and best practices. Being a daily user of AssetStack, I can say that one of the most important benefits is that: as steps and results of previous tasks are well-documented, we can use them to improve our actions the next time. As AssetStack grows with company’s need, ImWind is planning to further integrate – in the near future – all data related to power plants and their management, from warehouse and human resources to health and safety procedure.